I think it’s no secret that websites are an efficient way to promote one’s business. From paying bills to grocery shopping, people carry out even their smallest of tasks online. Why? You know the answer; it’s convenient and the Internet spares people much time and efforts. As a consequence of this technological era, more and more people are relying on websites to boost their online presence. But let me tell you something, a steady and reliable website does not only increase your online presence in the market, but it also brings in potential revenue your way. However, like any vehicle needs fuel, a website needs also a hosting plan in order to have an excellent and fast performance. In this article, I’ll be reviewing my experience with Innoview, and how its services can be profitable for you. Founded in 2010, Innoview.Host has been in the web hosting business for well over 8 years now. The name Innoview.Host is uniquely apt since they are known in the Online World for their innovations and support to many large organizations. They are providing a wide range of IT solutions to those who embrace the approach of excellence and professionalism. The team at Innoview.Host believes that every customer’s objective is to grow his business, they assist every professional and company in order to achieve their goals and make an easy profit from their online presence. Innoview.Host isn’t one of those web hosts which focuses on building its own profits only and have no regard for the user’s requirements. Instead, customer’s satisfaction and peace of mind is the ultimate goal at Innoview.Host. Innoview’s flexible and easy-to-use interface is one of the prime reasons why I liked their hosting. The execution and management are amazingly straightforward. I was honestly pleased to know that Innoview.Host respects a user’s independence. After I was hosted with Innoview.Host, I was a bit anxious about it setup. However, I found that its cPanel was entirely ready-to-use with FTP and SSH access. I didn’t have to go through the whole fuss of having to optimize its settings. It really spared me a lot of trouble and time. Just like me, I’m sure you would like things to remain simplistic on the cPanel. For future reference, you shouldn’t worry about the interface. It’s all completely easy and already configured. Privacy and security should be the highest priority for every web hosting provider. After all, who would want to be hosted by a company which couldn’t even make the user feel at ease. Initially, I wasn’t entirely confident over the security solutions offered by Innoview.Host. You cannot blame me after all, everyone would wish to steer clear of cons. However, soon after becoming a customer of Innoview.Host, all of my doubts went off the back door. In only a few days, I was satisfied with the DDoS protection and other security solutions I was granted with. I think it’s brilliant that the team staff at Innoview.Host is available every waking second of the day. Innoview.Host is a Greece established web hosting company, hence I was assuming due to different time-zones, I would have some difficulty while contacting them but I was fortunately wrong. It’s really common for complications to arise, and just like most people; I am not much into technological knowledge either. Thus, I decided to contact the team and was thoroughly pleased to see multiple options to reach them. Innoview.Host has given access to their customers so they can reach the team via live chat, email, phone or Support Tickets. Just as I was curious, I decided to try all of the above approaches and was awed with how quickly they responded to each of my query. I proudly claim that I am a fan of Innoview’s marvelous technical and after-sales support. It’s a universal fact that data is one of the most important assets for pretty much everyone. Whether a teenager or a business tycoon, all of us dread the day our data gets wiped or stolen. The worst-case scenario is when there are no means of recovering the data. I mean one cannot endure a bigger nightmare than that, although with Innoview.Host I was tension-free. With each Cloud Linux and Windows hosting package, Innoview.Host is providing daily backups. This advantage gave me the peace of mind I needed, so I could go about carrying out my work, without having to worry about losing my data. Ever since I was officially an Innoview consumer, a whole new range of benefits was unlocked for me to choose from. They are offering means like cPanel & WHM 68 (Centos) for €30/month, Dedicated IP at €2/month, an additional bandwidth of 200GB at €3/month, and much more enchanting features. Several of these extra added benefits were useful to me, so all I had to do was purchase whatever I needed, as easy as that. However, they guaranteed a 60-day money-back refund, if I am not satisfied for the hosting service or for any reason. There are thousands of other web hosting companies, and it can get pretty elusive opting for the one most valuable for your website. Believe me; we’ve all been through that dilemma. At the end of the day, it all comes down to one thing, quality. With the superior Innoview.Host serves, I would pronounce that its pricing range is pretty reasonable according to fellow web hosts who may have some lack at quality and at their technical support. 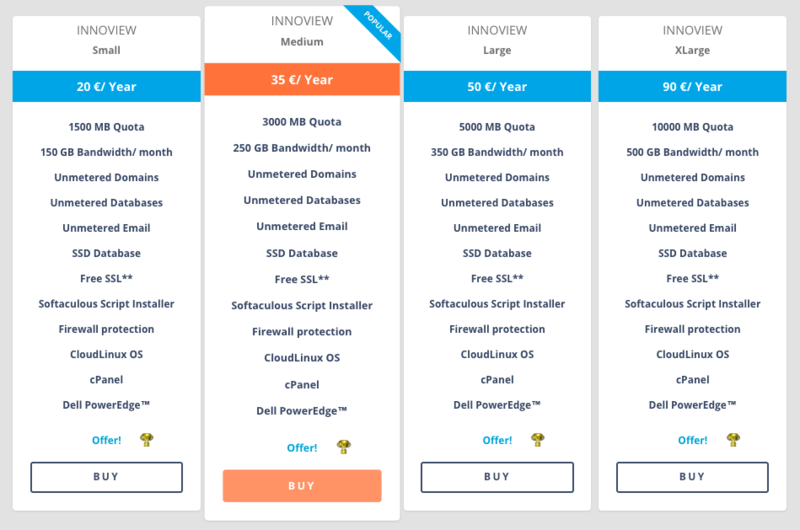 Innoview.Host, on the other hand, is offering brilliant hosting solutions without exceeding the average budget line. 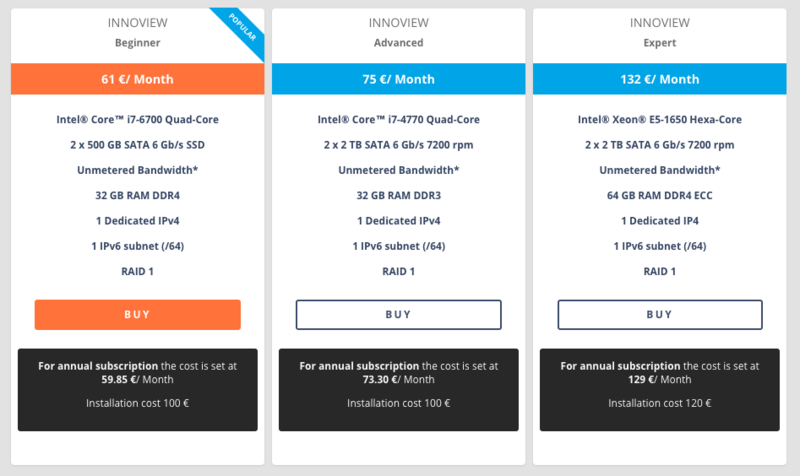 Innoview’s Basic Linux hosting plans are starting from €20/year, while Support Plus plans are starting from €120/year. The managed Linux WordPress hosting plans are starting from €14/month, and Reseller hosting plans are starting from €150/year. Innoview’s Basic .NET hosting is starting from €80/year, while Reseller .NET hosting is starting from €220/year. Innoview’s VPS hosting plans are ranging from €8.50/month to €52/month, with absolutely zero installation cost. 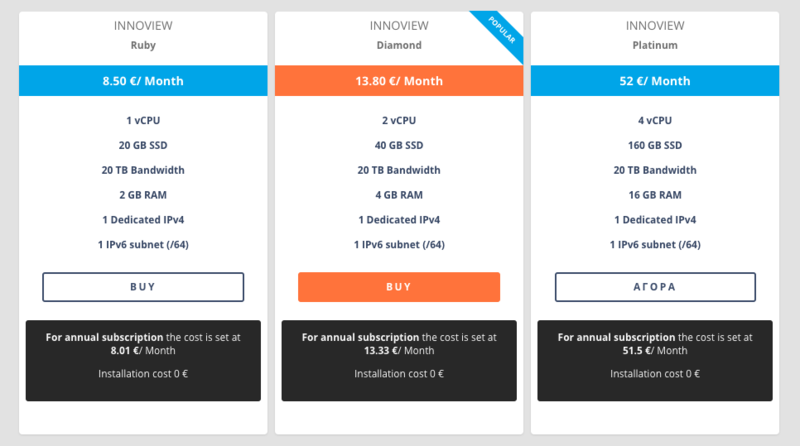 Innoview’s Dedicated Servers plans are fluctuating from €61/month to €132/month, along with €100 installation cost. Reliable email hosting services are starting from just €45/year added with 5GB of space with 3 email accounts each. My experience with Innoview.Host was overall great. I was satisfied with the solutions they provided at such affordable prices. Its customer support is very good, its management is splendid, and it came totally configured. For those of you still deciding whether or not to acquire Innoview.Host as your host, I would suggest in favor of it. In a nutshell, who doesn’t love economical and trustable hosting, right? Innoview.Host has been in the web hosting business for well over 8 years now. The name Innoview.Host is uniquely apt since they are known in the Online World for their innovations and support to many large organizations. They are providing a wide range of IT solutions to those who embrace the approach of excellence and professionalism.